I´ll see them perform live in Berlin soon, I´m so exited. Seriously, I looooove his fluffy hair. Deine Portraits sind schon beachtenswert und grandios. OH I LOVE YOU FOR DRAWING THIS! I really love your work !!!! SO BEAUTIFUL!! gosh i wish i could draw like you!! how was the Berlin show? i saw them at Lollapalooza in Chicago. Thank you so much. I saw them in Berlin, in Hannover and in Mainz. Mainz was open air, it was definitively the best. It was their last gig in Germany for a longer time. Aaaw, thank you so very much, what an honor. You're most welcome dear Vivalavida...!!! Amazing work. Such detail and shading. Yeah, it's better than mine. It´s all just a matter of practise, believe me. Keep on drawing and you will see. Yes, I know. It´s a little bit too much hair...Thank you, dear. i'm quickly becoming a fan of your work! You're welcome! Just sayin' the truth. Lovely! One of my best friends saw them on Halloween and he sung to her! Only for a couple of seconds, but ye and no pronlem! Aaaw, thank you so very much for the compliment. But I have to say that I´m not really pleased with it so I think I´ll do another BJ-Portrait soon. I must say, you are extremely good. ^-^ It looks just like him. I hope you have fun at the concert. It's defiantly worth being there. Billie knows how to make people have a good time. Thank you, dear. I´m not really pleased, I´m sure that I will make another drawing soon. Oh yes, the concert was so great, it was just perfect. I think it's amazing. I could never draw something like that. Yeah, right after I left you the comment, you posted a journal talking about the concert. 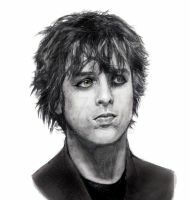 I just want to ask your opinion, do you like Billie's new haircut? OH, do you mean that blonde on both sides ? I hate it.